What a great alternative to the traditional pumpkin pie! Invite a neighbor over, stand by the warm coals, and visit while this delicious dish cooks up in your dutch oven. OR you can buy the pre-made pie crust dough and just roll it out in a pie pan. Mix together the dry ingredients for the crust and then add water. Knead until you have made a firm pie dough. Roll out two sheets with a rolling pan into even and flat pieces of dough in the desired size for the base and top of your pie crusts. Fit one sheet into a pie pan as the base. Mix together the pie filling ingredients. Pour over bottom layer of pie crust in pie pan. Cover and seal the edges with the second sheet of pie crust dough. The best way to make this over the fire is by using a Dutch oven. You should start by greasing the bottom and sides of the Dutch oven so that your pie does not stick. (This is not necessary if you have a pre-made pie crust already in a foil type pan or if you have rolled out the dough and put into a pan beforehand.) Place the pie crust with the filling in the Dutch oven and place over the hot coals of your fire. 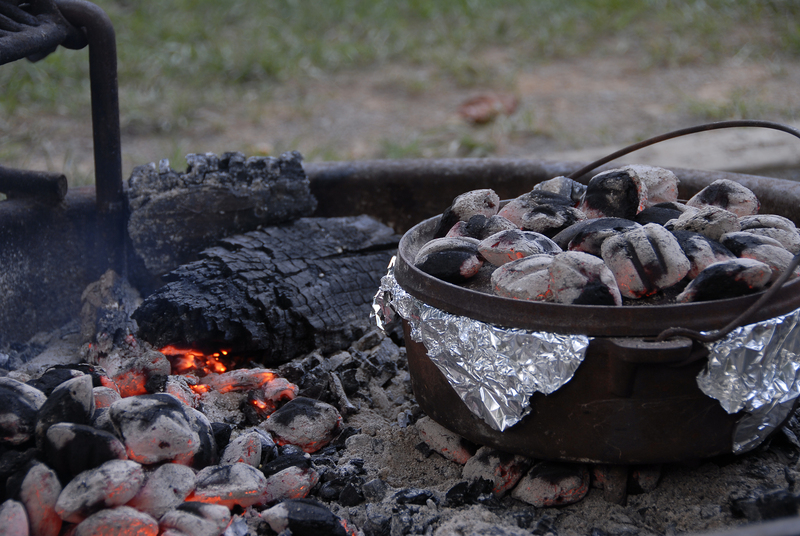 Finish by covering the Dutch oven with a lid and placing more coals on top of it. Cook for about 20-25 minutes or until crust is golden brown. Voila! A great tasting Thanksgiving dessert right over the campfire! Know of any other great Thanksgiving recipes? Tell us about them in the comments section below!